This is the last of the “Reel 37” drawings. A drill point dimple helps to distinguish the pawl pin from the two spring pins. The spring is easily bent with round nose pliers. 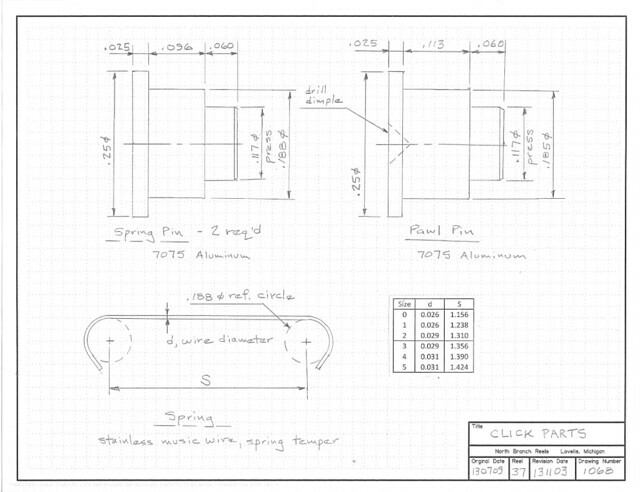 This entry was posted in Click, Plans, Spring. Bookmark the permalink. Nice drawings. Just a simple question. What kind of wire do you use to make the springs? It’s some heat treating involved? Thanks!. McMaster-Carr describes it as “Spring-Back type 304 stainless steel – bright finish”. See, for example, their part number 8908K28. Conveniently, it comes in 1 foot straight pieces. It is already at spring temper and needs no heat treat, but you can still bend it with pliers.